Vladimir Jurowski was the father of the conductor here, Michail Jurowski. He was also the grandfather of his namesake the principal conductor and artistic director of the LPO. That's quite a dynasty and one that vies with the Tcherepnins, the Karabits and the Avshalomovs. Vladimir the composer was born in a small Ukrainian town and inevitably moved on from the best Kiev had to offer to the Moscow Conservatory. There he was taught by Miaskovsky amongst others. His success in the world of Soviet film music (feature and cartoon) was supplemented with a modest string of works in other media. There are four other symphonies, a ballet Scarlet Sails, oratorios Heroic Deeds of the People and The Song of a Hero, two string quartets, a piano concerto and the tone poems Moscow Carnival, Red Square and Processions. On the showing of the two works on this disc Jurowski's music while intriguing breaks no moulds. It is accomplished and feels well crafted but is not deeply stirring. The three-movement symphony dates from the last year of Jurowski's life. It has some Shostakovich-style moments, as at 19:00 in the first movement where the drums are likely to remind you of Shostakovich’s Symphony No. 7. However it lacks the salty lash of originality brought to the table by Vainberg who also boasts some strongly Shostakovich-like touches. Here and there we hear the influence of Pyotr Tchaikovsky, for example in the sometimes gentle pages of the second movement where the similarly indebted soundworld of Rostislav Boiko's symphonies floats into hearing. There are some craggy fanfares in this movement as well. These recall Miaskovsky, his teacher in Moscow. There's also a surprisingly direct touch of the central Asian exotic USSR at 7:13 in the shape of a singing solo bassoon. The finale has anxiety and violence in predominance with the uproar of stomping percussion-led whooping and impudent-arrogant marches again taking us into Shostakovich territory. The music rises to massive grandiloquence. It's a shade over-blown but what the heck. All this comes complete with a commanding organ and romping brass weaving confidently across the canvas. Bells and percussion hammer home the message. The Norrköping violins sound to have a hard edge in this recording; not ideal. In 1956 Moscow saw a ground-breaking exhibition of Russian nineteenth century paintings. These pictures, previously closeted away in the Russian Museum in what was then Leningrad, were paraded in all their magnificence and variety. Jurowski's Russian Painters arose from that event. The composer who had visited the exhibition created a sort of sequel to Mussorgsky's Pictures at an Exhibition. This was written directly for orchestra but is without linking Promenade music. What we have is a grand suite of orchestral impressions: some are as short as 1:49; others as long as 5.32. The subject paintings range from Isaak Iljitsch Levitan's Above eternal peace with lavish Rimskian cinematic writing for the strings and a rather Russian nationalist flavour generally. The next viewing is of Ivan Tsarevich, riding the grey wolf by Viktor Michailowitsch Wasnezow in which peaceful reflection becomes animated and explores rhythmic energy in a way that look backwards to Shostakovich. Portrait of an unknown woman by Iwan Nikolajewitsch Kramskoj is an essay in which sentimental violins are counterpointed with plodding timpani. The Morning of the Streltsy's execution (Wassilij Iwanowitsch Surikow) is black-souled Mussorgskian music, heavy with a bleak and tragic clamour. Konstantin Alexejewitsch Korowin's A winter scene is very brief and playful, seeming to ape Mussorgsky's "unhatched chicks" with flighty-fluffy music out of the same grab-bag as Love of Three Oranges. Alenushka (Viktor Michailowitsch Wasnezow) has the "look and feel" of music for the silver screen: the sot of music you may imagine would accompany a 1950s Cary Grant caper - well, the Russian equivalent. Jurowski ends with Maslenitsa by Boris Michailowitsch Kustodiew. In this we again appear to be in the sphere of popular Russian cinema spectaculars with a barely containable gathering excitement. It reminded me of music with a similar effect by Franz Waxman for the film Taras Bulba (The ride to Dubno). This suite presents the listener with pictorial and colourful writing with a light and occasionally spectacular accent. 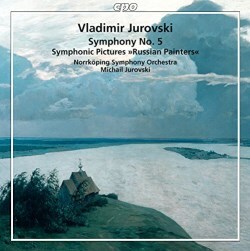 I should add that the CPO booklet and insert cannot make up its mind whether it is Jurowski or Jurovski. It shows Jurovski on the cover but the more usually encountered Jurowski elsewhere. Also at one point the Symphony is referred to on page 11 as No. 4. Given all the other references that should have read No. 5. This CD introduces us to a Russian composer we have probably never heard; still less heard of before. The music, sometimes virile sometimes vivid, overall rates as interesting rather than irresistible. Even so I am pleased to have heard it and hope to hear more. What about those other symphonies, the piano concerto and the orchestral tone poems?